Note: This is a post from Courtney Baker, chief seller and long-time running wo-man of MvD. I frequently hear from our readers that they can’t wait to rid their house of crap, but don’t know where to sell their things. 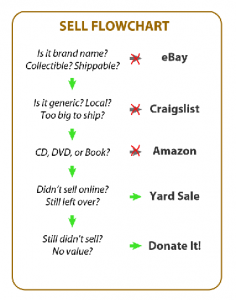 They know the options – eBay, Craigslist, Amazon, yard sales, consignment shops. But they don’t know which marketplace is better for each item. There are hacks, tricks, nooks and crannies that sellers have mastered so well they actually make a living buying and reselling in these marketplaces. Not to mention, there are plenty of “if” and “unless” clauses that could overwhelm any newbie. Books don’t sell on Craigslist, unless you have a trendy bestsellers at the peak of its popularity (Twilight, Hunger Games, 50 Shades of Grey, etc). When Adam and I started to sell all our crap, we went into the trenches to figure out this maze of selling used goods. We had some epic fails at first, but we eventually mapped out a system that worked well for us. In fact, we’ve sold everything from silverware, books, electronics and couches to a tanning bed, a French horn, and even an RV! We ran every single item through a flowchart to figure out where we should sell it. I’m going to sell the four items pictured above. 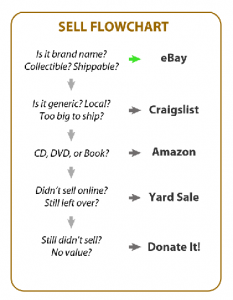 I’ll walk through the flowchart and demonstrate how I determine where to sell each thing. I hope you see quickly that you can sell most things at each marketplace. But we’re searching for the best marketplace. The five books I’m selling are all New York Times bestsellers – that peaked five years ago. Unless they’re classics or rare editions, books lose their value quickly. But let’s look at our options. Is it brand name? Kind of, bestsellers. People definitely sell books on eBay, but it’s not your best option for non-collectible items. eBay would be better if you have a collection of books like the Harry Potter series. Keep moving through the flow chart. Is it generic? No. Local? Doesn’t have to be. Too big to ship? No. Craigslist is not a great platform for selling books. You may find people selling books, especially the HOT books, but it’s more luck-based. Keep moving through the flow chart. CD, DVD, or Book? Yes. Jackpot! Amazon is a great place for selling your media whether it’s a CD, DVD or book. Because these books are older, the market might be flooded, at which point I would need to continue through the flowchart to Yard Sale and then Donate. It’s an iPhone in good condition with all the accessories This version was two releases ago (before 4s and 5), so it’s a bit outdated. But you never know until you research it! Is it brand name? Very much so, Apple iPhone. Small name-brand electronic devices are GREAT on eBay! After a quick search, I also found that the iPhone 4 is still in demand and many are selling between $90-$150. I would stop right here. Sometimes your local Craigslist market could be an option, but I’ve had more consistent results selling smaller electronics on eBay. We have a bundle of Leap Frog Tag Junior books plus the reader. This is a high-demand toy, name brand, and a bundle. Is it brand name? Yes, Leap Frog. Since the items are in demand, brand name, and shippable, eBay is a realistic choice. They might not be collectible items, but I have a bundle of them (or a lot, to use eBay lingo). My next step would be to research the current and past listings to see if there’s really a market for the Tag Readers. I would normally stop here, but Craigslist actually has a huge market for all things kid and baby. 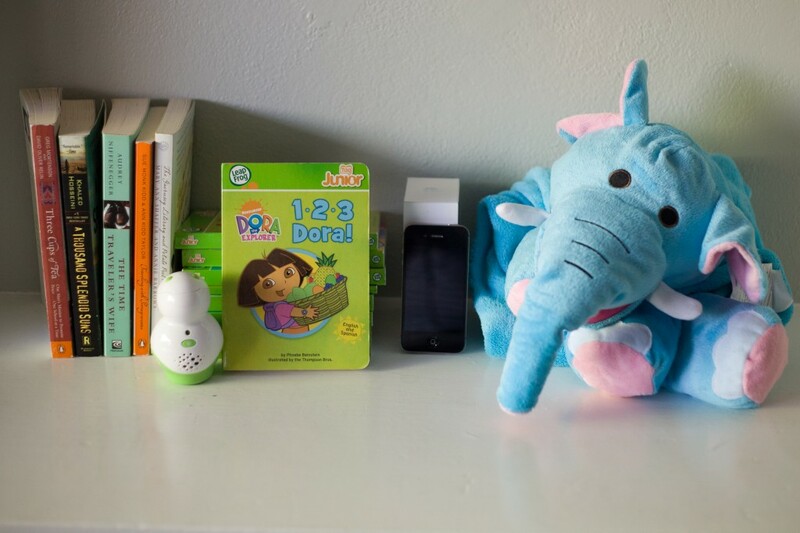 Normally, CL is great for general searches like “highchair,” “couch”, or “TV.” But there are a few specific products that are taking off in this marketplace, including name-brand baby stuff, vehicles, and larger electronics. Making a listing on CL is easier than eBay, so I might try to sell it here before eBay in this case. Why not Amazon? They’re books, right? One of the pros of this item is that there’s a bundle of several books. On Amazon, you have to list books individually. I might be successful selling each book on its own, but I’d prefer to be one and done. Random small household items are the worst to sell. There isn’t enough demand for them to have a listing on eBay, Craigslist, or Amazon. For these items, you need to start thinking about hosting a yard sale or simply donating. Surprisingly, clothes typically fall into this category. Unless you have some name-brand specialty clothing, it’s very difficult to resell your clothes for anything near the price you paid. You can go deep into selling strategies and market research to sell your crap. Hopefully you can save time with some of these basics. If you want to take your selling beyond this flowchart, then Sell Your Crap might be your next step. For your copy of the full What to Sell Where Flowchart, as well as several other awesome resources to “kickstart your money,”join the Man Vs. Debt community list by clicking here! What hacks have you discovered in selling your crap? Which marketplace is your favorite? Who Keeps Track of Finances in Your Family? 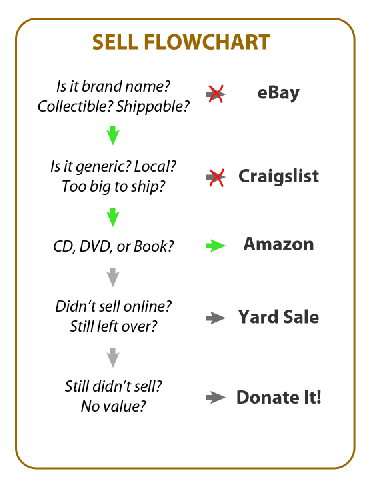 Great flow chart, never thought of doing this much to sell the crap, but if ever I would have given a thought in detailed manner as you have explained, I would have surely earned extra dollars. Surprisingly, once you go through a couple items, it becomes a very quick process. It only takes me 3-5 minutes to list an item nowadays! Courtney – thank you! You have just literally saved me hours and hours and hours and put more money in my pocket that I would have gotten, trying to figure this out alone. WooHoo, Stephanie! Now what are you going to do with all the extra time? hehe! Awesome flow chart. It can be difficult to reasonably find which site would be the best and can get you top dollar for your item and time. This flow chart is great and thank you for sharing it. That’s the trick- figuring out where you can get top dollar with the least amount of work! I’ve been selling stuff online for nearly 10 years now and I agree with everything you said. 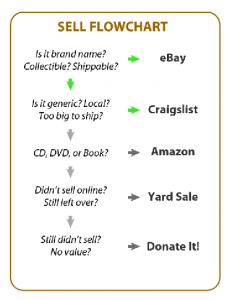 The flow chart is excellent and would be a great resource for anyone trying to sell an item. The one thing that wasn’t covered here (probably because it won’t change your decision) is the commission taken out. Both eBay and Amazon take anywhere from 5-15% (or cost you money to put a listing on), which cuts into the money that you would get back. I really like Craigslist if you can sell it there because you get to keep all 100% of the selling price. Thanks for the well-written article! Always happy to meet a fellow seller! If I’m going to break my rule of thumb, it’s going to be in favor of craigslist for three reasons. First, they have no fees. Second, I like that it’s less formal. Third, their iphone app allows me to put up a listing in minutes (research the other listings, take pictures, write a listing, and submit). Sometimes, I’ll even sacrifice making top dollar for my item because it’s the path of least resistance. Awesome flow chart. For clothing, don’t forget to take a look around at stores that buy used clothing. I’m not talking about consignment shops. If you have a lot of name-brand labels, especially for teens and tweens, there are places (like Plato’s Closet, for example) that will actually either give you cash or allow you to trade for new clothes. One other option, if you have a lot of stuff and want as little work as possible (once you have sorted out what you want to keep!) is to have an auction–some things you will get actually more than they are worth and some things less, but it is a good way to get rid of a lot of stuff in one fell swoop. We just did this in preparation for a cross country move and I was pleased with the results. This is really awesome stuff. I love that the last option isn’t ‘Give up and do nothing, let it sit in your house to collect dust’ – giving things away when they are no longer useful is the best thing you can do. 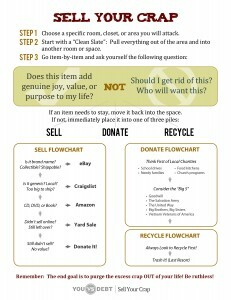 It’s a great psychological boost to get rid of clutter. Thank you much for the flow charts and information. Do you have any larger high quality copies of the flow charts pictured here? When I tried to increase the size of just the images they became distorted. Cool system to sell off crap! I think we’re all guilty of buying stuff we don’t need. Damn marketing!. Here’s a great quote I came across in a book – “many people by stuff they don’t really need, with money they don’t have, to impress people that they don’t like!”. Think twice about buying that item! Great information! What about selling leather clothing such as pants, blazer and long coat? Would leather clothes be better suited towards a yard sale and donation? For CDs, DVDs, and video games, I did better at SecondSpin.com or AbundaTrade. In fact, I kept both windows open to see which would offer me a better price. Sometimes it was several dollars difference – per item! A bit time consuming, but it can be finished immediately rather than waiting for a sell on Amazon.